Visit to iconic Monument Valley & Viva Las Vegas! 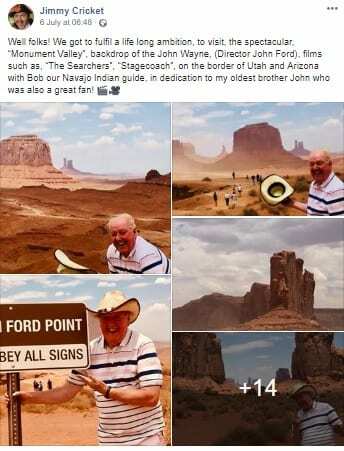 Jimmy Cricket got to fulfil the ambition of a lifetime when he visited the legendary Monument Valley in the United States of America. Monument Valley Navajo Tribal Park is a red-sand desert region on the Arizona-Utah border, known for the towering sandstone hills recognised by their steep sides and flat tops. The park has frequently been a filming location for Western movies. The famous entertainer kept his friends and fans up to date regularly with his trip on his social media channels. He and Mrs Cricket were joined during the holiday by their eldest daughter Jamie, who currently works as a deputy headteacher in the Cayman Islands. 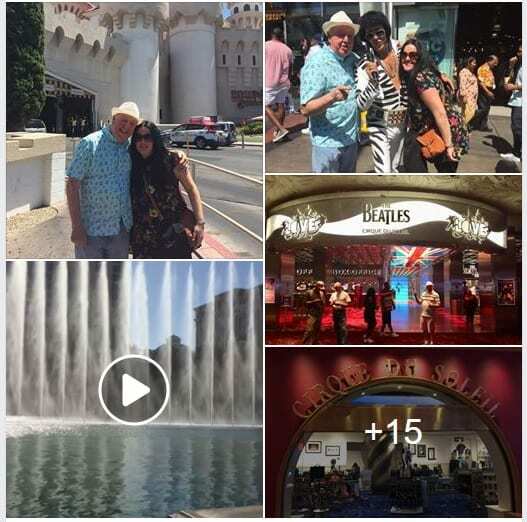 Among the shows they watched in Vegas included the Bellagio’s dancing waters and Cirque Du Soleil, at The Mirage, a 3,044-room Polynesian-themed resort and casino located on the Las Vegas Strip in Paradise, Nevada. Jimmy, 72, and Mrs Cricket set off back from the US on Saturday (7 July). “Las Vegas you have been a blast, (and while touring there and back), ‘Monument Valley’, you have been truly inspirational, now on our way home!” said Jimmy.